Karl Heise decided to sell some of his OSSAs in 2017. I knew he had the makings of this old motocrosser, so I asked if he would sell it to me. When I got there on a cold November Friday afternoon, I got to see just how rough this carcass of a motorcycle was. But we have never seen one in the U.S.! I had to take the project on. 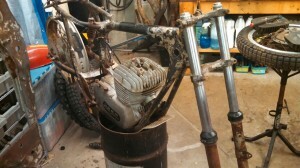 Karl helped with some better parts – gas tank, fork tubes, etc. 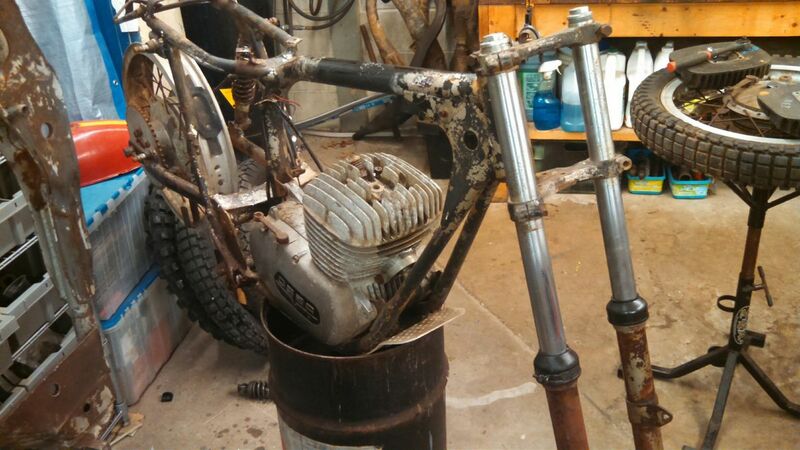 Everything was very rusty – frame needed repairs to fork stops, side stand bracket, foot peg mount and swing arm. Al Snoop provide the 230 cylinder and NOS side stand – both parts very difficult to find. So, it’s late March 2018 and I’m ready to start reassembly. Wheels are rebuilt, frame is painted, bodywork is repaired and primed, fasteners cadmium plated and chrome bits replated. Paint and engine rebuild will follow. Check out the pics of this rare piece of junk!